A new study suggests the number of cases of colon and breast cancer could be cut dramatically if people got more vitamin D.
University of California researchers estimate 250,000 cases of colon cancer and 350,000 cases of breast cancer could be prevented worldwide by increasing intake of vitamin D. Sunlight spurs production of vitamin D in the skin, and people who don't get much sun exposure tend to have lower levels of the vitamin. Past research indicated that vitamin D helps slow the growth and spread of cancer cells. 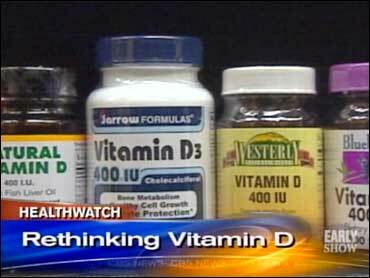 "There's been a lot of evidence for a long time that vitamin D is very important, not just for bones, which everybody knows, but for all the organs in the body," Dr. Larry Norton, an oncologist at New York's Memorial Sloan-Kettering Cancer Center, explained to Early Show co-anchor Harry Smith Thursday. "What's very interesting," he continued, "is that all humans really can (trace) their ancestry to just a few thousand people who walked out of Africa into what is now Yemen, just about 80,000 years ago, and populated the whole earth. "As people moved further north, their skin got lighter. Why? So it could absorb more vitamin D from sunlight. But now, in the modern world, we wear clothes, we wear sunblock, we work indoors most of the time - so, essentially, nobody who lives outside the equator gets enough vitamin D, especially in the winter months. "This study was interesting because it looked at sun exposure, cloud cover, as well as vitamin D levels in over 170 countries. And there's a clear association with less sun, lower vitamin D levels and higher incidences of certain cancers, particularly colon cancer and breast cancer." Norton pointed out that, "There (could always be) other explanations. Any scientific study is going to have lots of debate and argument. This study, the numbers will be debated back and forth. But there's no question that we don't have high enough vitamin D levels, especially those of us who live further from the equator and have longer winters. "You don't necessarily want to get that Vitamin D from sun exposure, because that's going to age your skin, and it's going to increase skin cancer. But simple supplementation can make a big difference. "What's fascinating about this study is it does make a recommendation of 2,000 international units of Vitamin D a day, which is much higher than the current recommended standards, more than twice, for older people, especially. That number, people are going to talk about.
" … Actually, 2,000 a day is safe. There's a lot of studies showing 2,000 is safe. You don't get into toxic levels until you get to much higher levels of exposure. For almost everybody, 2,000 is safe, and could make a difference." What's more, said Norton, "This study focused largely on colon cancer and breast cancer. But, there is smoking gun evidence in other cancers, as well, especially prostate cancer. "Much more work has to be done in this area. But this is one spot where oral supplementation of vitamins may make a lot of sense. Make sure you take enough vitamin D.
"I think this needs further discussion about what is the recommended daily allowance. Right now, (many) of us think it's much too low, and we should be taking more."